The troop of Indian shuttlers who travelled to Arena Birmingham ensured that the first day of the landmark event in the badminton calendar brought with it plenty of dramatic action on-court. The pursuits of the Indian players have always been one long elusive stretch to lay their hands on the All England Badminton Championships title enough number of times at regular intervals. With a lot of expectations pinned on their shoulders, tournament favourites PV Sindhu, Saina Nehwal and Kidambi Srikanth put their best foot forward to begin their campaign in the Championships. Other than this trio, Sameer Verma, HS Prannoy, B. Sai Praneeth and doubles duo of Ashwini Ponnappa/Sikki Reddy also opened their bids for the elusive trophy. India was quick to meet with disappointments early into the start of the tournament as the fifth seed and obvious favourite, PV Sindhu, fell fighting to Korea's Sung Ji Hyun in a tight three-set match. The match spanned over a tedious 80 minutes and saw Sindhu stalling eight match points in the final game, only to succumb to the Korean in 21-16, 20-22, 21-18. The loss came as a blow to the Indian contingent who had high hopes from the Hyderabad-born girl. In another delicious clash, HS Prannoy locked horns with B Sai Praneeth in the first round of the tournament. Prannoy didn't pose a major threat to the dominance of the 26-year-old Praneeth who overcame the hurdle set by his countryman in an easy 21-19, 21-19 victory. Sameer Verma went up against sixth seed Viktor Axelsen and put up a brave fight that lasted for 65 minutes. While the first game saw Verma lead the way convincingly, Axelsen notched up his playing standards and hammered Verma in the succeeding games to win in 16-21, 21-18, 21-14. The doubles players also met with no success and failed to progress into the second round of the tournament. All the four doubles teams that went in couldn't convert their chances and lost out to their opponents. The beacon of hope finally rested on Commonwealth Games gold medalist, Saina Nehwal and Kidambi Srikanth, who remained in pursuit of winning the title after an 18 year drought. The last time anyone lifted this elusive title was way back in 2000 when their coach, Pullela Gopichand had emerged victorious. Nehwal began her campaign against Scotland's Kirsty Gilmour. In a match that lasted barely 35 minutes, Nehwal showcased her usual style of clinical demolition of the opponent. She handed Kirsty a defeat in 21-17, 21-18 and secured her seventh consecutive win over the Scot. On the other hand, Kidambi Srikanth, seeded 7th in the tournament went up against Frenchman Brice Leverdez. Srikanth left no room for error and sent Leverdez packing in 21-13, 21-11 in a neat thirty minute showdown. 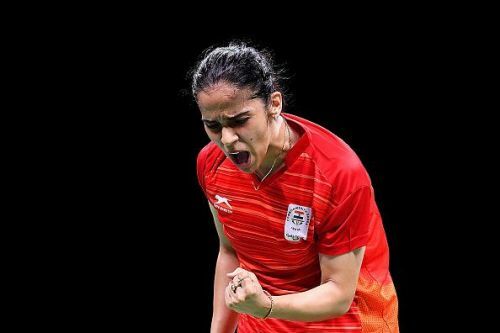 The second day of the tournament will witness Nehwal clashing against Denmark's Line Kjaersfeldt while Srikanth has set up a date with Asian Games gold medalist, Jonatan Christie from Indonesia. B Sai Praneeth will be going up against NG Ka Long Angus. While the first day proved to be disappointing for the Indian brigade, all hopes have now boiled down to Nehwal, Srikanth and Praneeth to undo the jinx embracing this tournament for the last 18 years and lay their hands on the title.